Our main goal at Style & Poise is to assure our client’s satisfaction. We want you to walk away feeling inspired and with a fresh perspective on your personal style. We would love to have a one-on-one to further discuss your style needs and how we can be of service in curating your signature look. Roni will hold a complimentary 30 minute phone call or in-person consultation to learn more about you and to begin your style discovery process. Do you need help finding a special outfit? Have you lost or gained weight and need a style overhaul? Are you tired of your current style and need an update? Then this service is for you. During this style experience we will curate looks that reflect your personal style. If local, Roni will bring several outfit options to you for fitting and selection. The pieces which do not work will be returned. With this package we can also assess your current wardrobe and create several looks from your existing wardrobe. This experience is all about what’s convenient for you. This styling experience is suitable if you’re not local or if you’re local but your schedule doesn’t permit for in-home or in-store styling. With this package virtual looks will be created to reflect your personal style and looks which meet your needs (as discussed in your consultation). Upon creation of various looks you will be provided with a look book and direct links of where to purchase all items while keeping your shopping budget in mind. Do you have a lot on your plate and shopping doesn’t seem to fit into your hectic schedule? Do you get overwhelmed when you enter a store? If so, allow us to take care of your shopping needs. During this process, Roni will take on the task of selecting items that meet your style and budget needs. Upon purchase, the items will be delivered to your doorstep. Do you often feel that you have nothing to wear? Does getting dressed in the morning feel like a chore? Then this package is for you. With this service, our main goal is to help you maximize your existing wardrobe and to make it as functional, as possible. We will assess the items you currently own and determine what stays, what goes, and what to donate (if you choose to do so). We want to ensure that the items that remain in your wardrobe are aligned with your personal style goals. 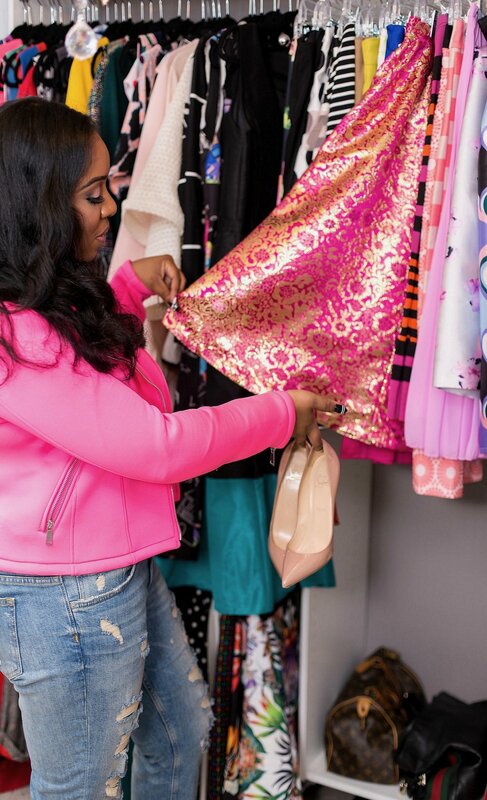 Upon completion of your closet cleanse, Roni will compose a list of recommended items to help you fill in the missing essentials needed for a complete and cohesive wardrobe. You will also be provided with store recommendations (based upon your style and budget). You may also choose to have Roni shop for these items (at an additional fee). Within two weeks of your closet cleanse, you will be provided with a virtual look book with 30 outfit pairings to serve as a guide of the different ways to style various items in your wardrobe. Please note this service is a minimum of 3 hours. Do you have a particular item in your closet and you’re unsure of how to style it? Then Style on a Dime is for you. Provide us with several clear pictures of the item and we will send three styling options directly to your inbox with links for purchase. **Looking for a styling service that you do not see listed? Contact us and we can discuss customizing a package for you.